The 10th annual Midwest Primate Interest Group (MPIG) will be held in Iowa State University, Iowa on October 18th and 19th this year. The amazing Dr. Jill Pruetz will be the local host. 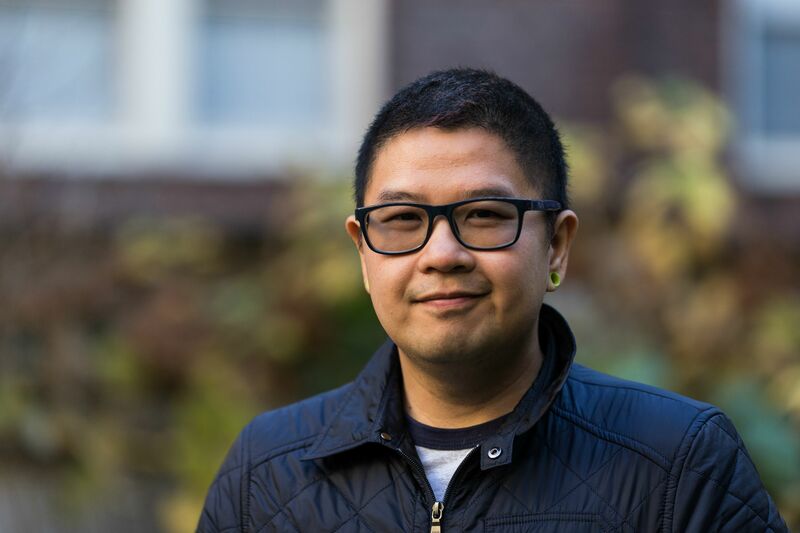 I will be at the conference and I look forward to seeing familiar and new faces there. Here are some info you might find useful if you are interested in attending or presenting at the conference. Thanks for Dr. Katherine MacKinnon for the write up! Registration fees are $15 for students and $40 for faculty. Please make your check payable to the Midwest Primate Interest Group and mail to Dr. Robert Sussman, MPIG Treasurer, Department of Anthropology, Washington University, Campus Box 1114, One Brookings Drive, St. Louis, MO 63130. (You may register onsite as well). MPIG has a group block of hotel rooms from October 17-19 at the Hotel Memorial Union on the Iowa State University campus. For reservations, call 1-800-433-3449 and mention the Midwest Primate Interest Group to get the group discount. 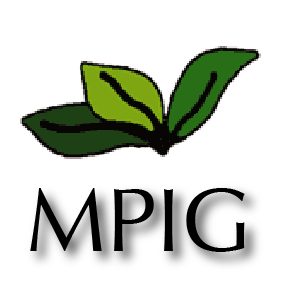 Just a reminder: as we transition from our old website to a new one, please check the MPIG facebook page for all the latest information and updates. 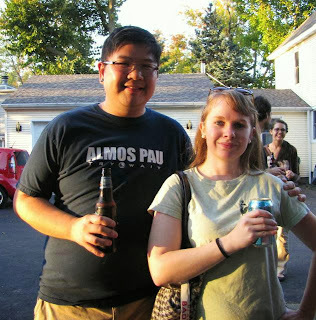 The 9th MPIG conference at University of Northern Illinois with my homegirl Ashlee of This is Serious Monkey Business blog. Previously available in French and recently translated to English by Robert Martin, Primates of the World by Jean-Jacques Petter & François Desbordes is a beautifully illustrated guide that is perfect for those who are interested in primates and a great reference guide to use for primate classes. 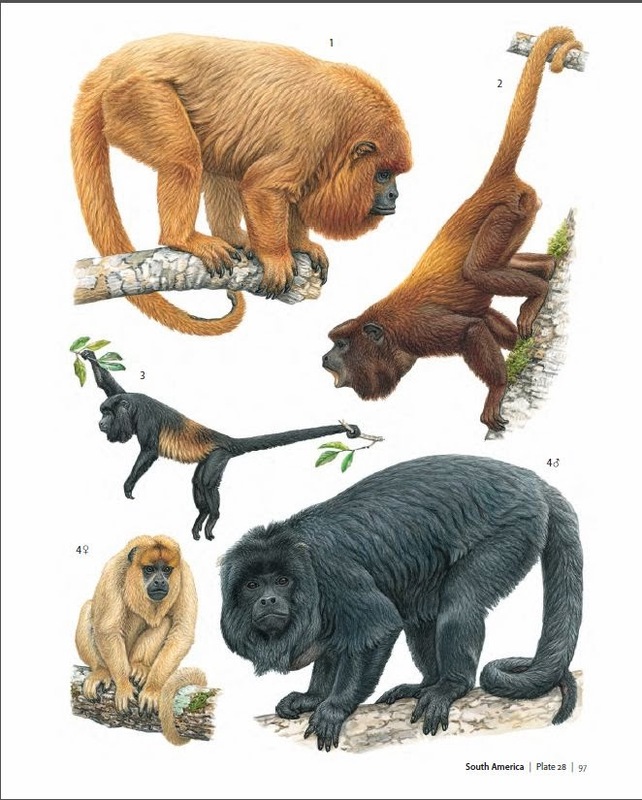 Found throughout the book are 72 color plates that perfectly capture the natural movement and colors of nearly 300 species of primates by highlighting the male, female, adult and juvenile forms. Primates of the World includes concise introductory chapters that discuss the latest findings on primate origins, evolution, behavior, adaptations and classification. In one of the chapters titled "Evolution of Madagascar's Lemurs", readers can find out what adaptive radiation is and why adaptive radiation is so important in understanding the evolution of Madagascar's lemurs. In the same chapter, readers are introduced to the Gray Mouse Lemur (Microcebus murinus) and why this species is important in understanding how the process of adaptive radiation happened in Madagascar. There is also a chapter on primate communication and sociality, complete with lifelike illustrations of howling primates that seem as if they are ready to bellow out a cacophony of songs. The majority of the book is all about the color plates and primate descriptions. The primates are sorted by geography: Madagascar, South America, Asia and Africa. Classification, brief summary and habitat range of each genus is presented on the left while the color plates are presented on the right (except for a few genus with a large number of species) in facing page format. For a preview of this book, click here. In summary, these water color illustrations are amazing and very fun to look at. Since this is not a new reference book (original French edition published in 2010), some of the newly discovered primate species are not included. Descriptions for primates are succinct yet not too wordy. For $29.95, this is a great book to have as a reference or as a coffee table book. Jean-Jacques Petter (1927-2002) was a world authority on lemurs and one of France's leading primatologists. He was a research fellow at the Centre National de la Recherche Scientifique in Paris. François Desbordes is one of France's premier wildlife illustrators. Robert Martin is the A. Watson Armour III Curator of Biological Anthropology at the Field Museum in Chicago. If you are interested, you can get this book in your local bookstore or online through Princeton University Press. Dana cleaning her daughter moments after giving birth. Photo from BBC News. Ladies and gentlemen, we have the world's first video of a Sumatran orangutan (Pongo abelii) giving birth. Why have we not have any videos of them giving birth? Well, Sumatran orangutans give birth at night (pitch black) and also high above the forest canopy. So, that's probably why. So we have the mother, Dana, who is a 25 year old Sumatran orangutan from Jersey's Durrell Wildlife Conservation Trust (this Jersey is in the UK, not US). Dana suffered complications in her previous pregnancy in 2009 and resulted in a stillborn. These complications left her with blocked fallopian tubes, making her infertile. However, experts from Jersey General Hospital’s head obstetrician intervened in 2012 to help Dana conceive and a little help from the 27 year-old male, Dagu. On June 9th, Dana give birth to a female infant which was named KeaJaiban (you see, "KeaJaiban" is Indonesian for "miracle"). The birth of KeaJaiban (or Kea for short) was indeed miraculous, owing mostly to the surgery to unblocked Dana's fallopian tubes. The video below might be not safe for work (NSFW) and I thoroughly recommend that you don't watch this after or before a meal. But then if you are like me, this will not phase you. 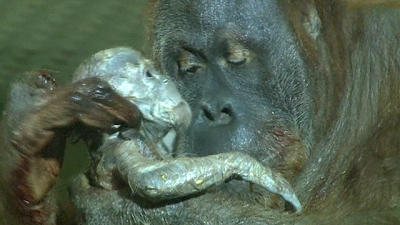 World's first video of a Sumatran orangutan (Pongo abelii) giving birth. Video from YouTube. Orangutan birth is relatively quick (as are most primates). The baby comes out of the birth canal and immediately held on by the mother. A few licks on the baby to make sure that the baby is alright, the mother then clears the baby's airway. The baby then starts to cry and scream (like a human baby). The mother then ingests the placenta (placentophagy) and bites off the umbilical cord. Placentophagy is very common in mammals, even in humans. I think the most amazing (and coolest) part of the video is when Dana brought her baby and presented her to the staff! Singleton, I., Wich, S.A. & Griffiths, M. 2008. Pongo abelii. In: IUCN 2013. IUCN Red List of Threatened Species. Version 2013.1. <www.iucnredlist.org>. Downloaded on 10 August 2013. What spooked the hamadryas baboons at Emmen Zoo? Someone or something done did spooked the hamadryas baboons at Emmen Zoo in Netherlands last week. 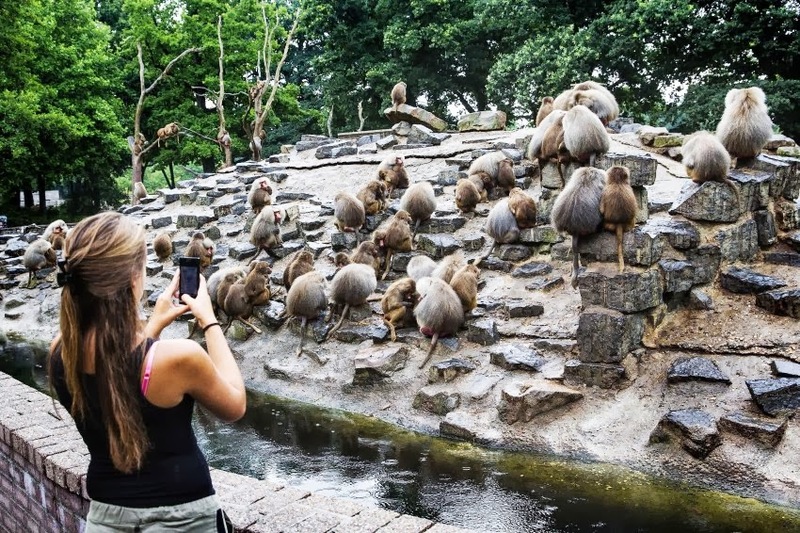 All 112 baboons in this Dutch zoo were exhibiting rather unusual behavior according to numerous news sources. The hamadryas baboons in Emmen Zoo suddenly became hysterical last Monday. It took about an hour to get the baboons to go back into their night enclosure in the evening, which normally takes about a minute according to the zoo spokesman. For the next two days, one group sat in a tree and "refuse" to come down while another group sat on an exposed part of the island in the hot sun. This group later moved to a shadier location, but remained "depressed". The baboons were huddling together. The zoo keepers brought apples for the baboons (awww, they do love apples) but the baboons ignored the treat. Keepers also placed food above ground, which are normally hidden in the ground to elicit foraging. The baboons also ignored the food. It it not until the third day that the baboons started eating. "They [the baboons] would sit with their backs to the public. They wouldn't make much noise; 'it was rather silent, which is not normal for a baboon'", said Wijbren Landman, Emmen Zoo's press officer and biologist. "If one of the leaders is shocked by something than most of the colony will obey him and then the whole colony will be shocked. But what really caused one of the leaders to be shocked, well, we didn't find out", Landman added. This wasn't the first time these baboons were acting weird; it happened in 1994, 1997 and 2007 as well. In 2007, all the baboons were observed looking at a very specific direction. 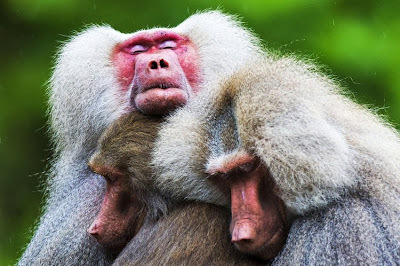 Since hamadryas baboons can live well over 30 years old, some of the individuals in the zoo have experience previous hysteria. OK I used a lot of air quotes but bare with me on this one. If you really want to look at animal behavior and why animal exhibit these behaviors, one mustn't anthropomorphize the behaviors. The worse is when the baboons were described as being depressed. Or when the NPR article asks why the baboons were so sad. So instead of saying that the baboons were sad or depressed, one could say that the baboons were lethargic or not moving a lot? At least that's how I feel about it. But whatever, it's the news and not a scientific journal. Probable. Maybe there was a thunder that strike near the zoo. Though there no records of earthquakes in or around Emmen Zoo but the area does occasionally experience minor earthquakes. Did they felt something that wasn't on the radar, so to speak? 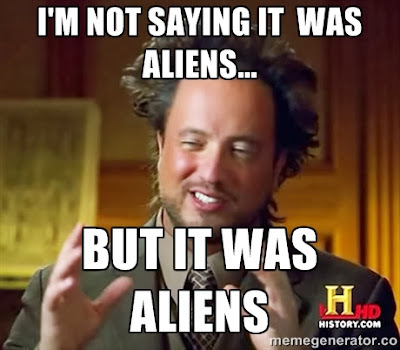 This is not the History Channel. Let's not go there. Very unlikely. Again, if they are easily spooked by other animals then there would have been more episodes of hysteria. According to Landman who consulted a "French baboon expert", hamadryas baboon exhibit hysteria in the wild, triggered by awareness of a predator but for a relatively short period of time. Zoo visitors might have spooked the baboons or maybe wore a T-shirt that has a picture of a predator (according to one of the news article, a lion). This is also very unlikely. Probable but unlikely. 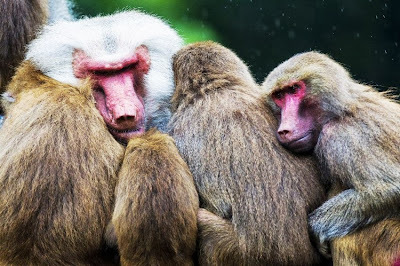 Just like the predator explanation, the baboons would have exhibited more frequent episodes of hysteria. But there might be other ways that the zoo visitors had unintentionally spooked these baboons. Maybe wearing a specific type of clothing. The baboons I worked with reacts aggressively towards visitors that wear trench coats (I would too, ewww the 90s called and they want their clothes back). So what do I think spooked the baboons? I'm gonna go with the unpopular opinion. I think it is a fear response towards zoo visitors. But what spooked them? For the fourth time in 20 years? Your guess is as good as mine. Wish I was there to observe their behavior though! Any guesses on why the baboons were spooked? Baboon updates from Emmen Zoo. All photos from Spiegel Online.